Finally, it’s the weekend. After having time off over the holidays, I have been trying to get adjusted to full weeks of work again. To say the least, it has been a little tough. The weeks feel a little bit too long and it seems forever for Friday to come around. Give me a few weeks and I will be back into the groove of things. Then there is crumble… yeah, I have crumble on my mind of late. Well maybe not of late, but for a while now. There is something about a good crumble that make a pie, coffee cake, or so many other desserts just that much better. Don’t you think?! 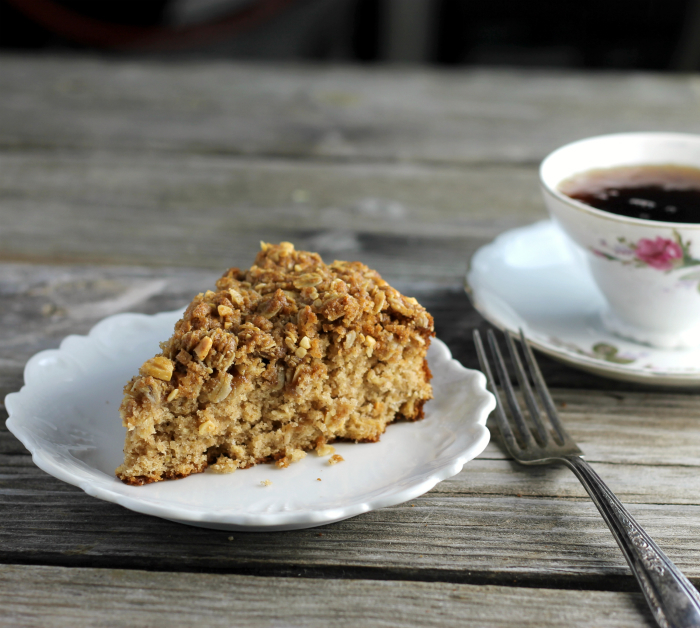 When I decided to make this coffee cake I knew that it would have to have a crumble to step it up a bit. 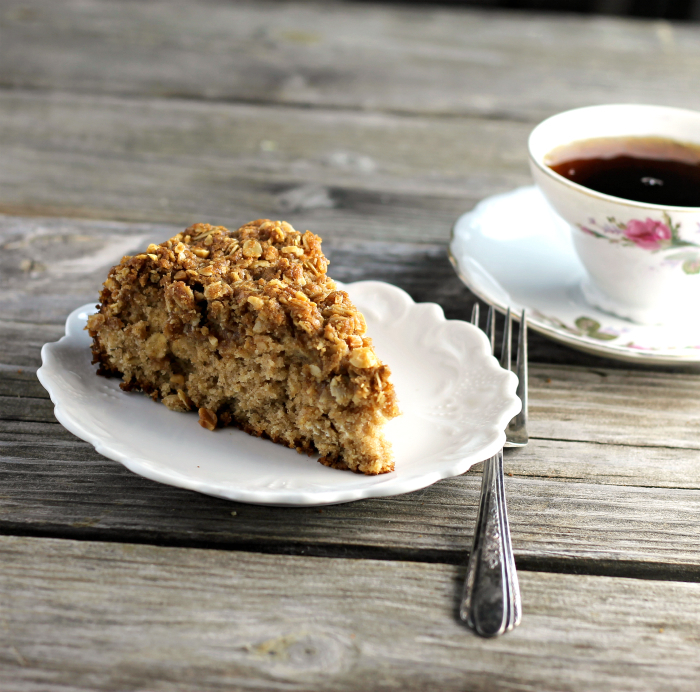 The coffee cake is simple and even though it has a great flavor, it’s the crumble that is the star in this recipe, at least in my book. Of late when making coffee cakes that have a crumble topping, I find myself going overboard with the topping. The first time I did this I was a little worried that it wasn’t going to work out. But after the first bite I was hooked, yeah you can’t go wrong with loads of crumble topping. Even though I am trying to eat healthier after the holidays, I found myself sneaking a small piece of this coffee cake for breakfast, it was too yummy to resist. 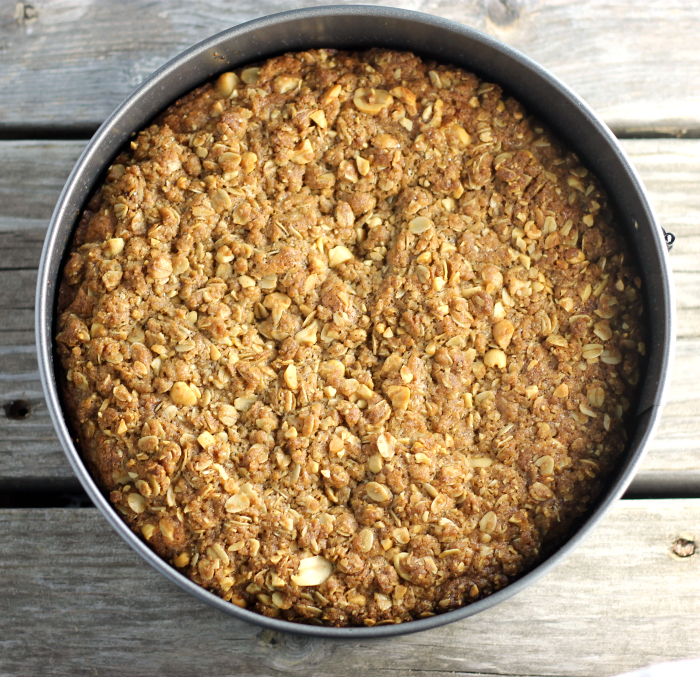 I had added cinnamon, nutmeg, ginger, cardamom, and peanuts along with the other ingredients for this crumble. And I have to say the crumble was the thing that really kept me craving this coffee cake. Do you ever daydream about crumble toppings? You may start after trying this one. In a medium bowl mix together the 1 1/4 cups flour, 3/4 cups oats, baking powder, sugar, 1/4 cup brown sugar, salt, and cinnamon. In another bowl add the eggs, 1/4 cup butter, sour cream, and milk, mix together until well blended. Pour the wet ingredients into the dry ingredients, mix just until blended. Pour the batter into the prepared baking dish. For the crumble - Combined all of the dry ingredients together. Add the 6 tablespoons of softened butter and mix together with a fork or by hand. Sprinkle over the top of the batter. Place into the preheat oven and bake for 23 to 25 minutes or until a wooden toothpick comes out clean. Remove from the oven and set on cooling rack to cool. This is so DELICIOUS! I love that it’s loaded with oatmeal. 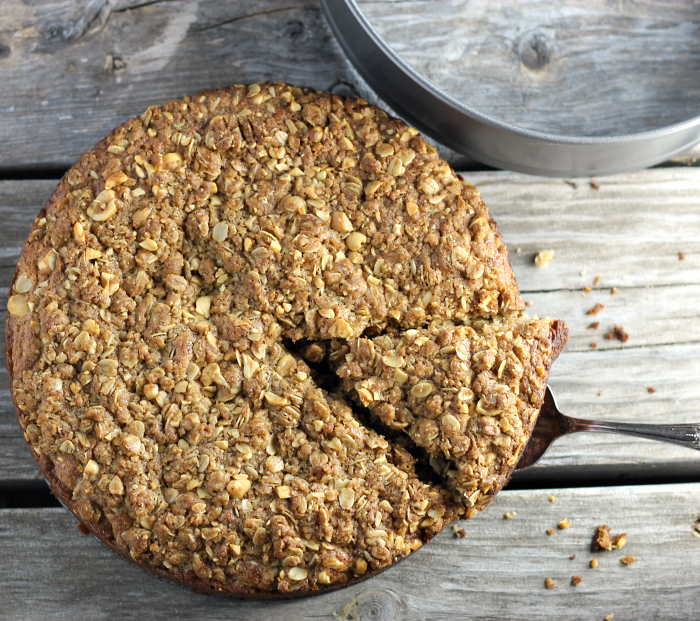 I have one coffee cake recipe that I trust, but now I have to give yours a try. 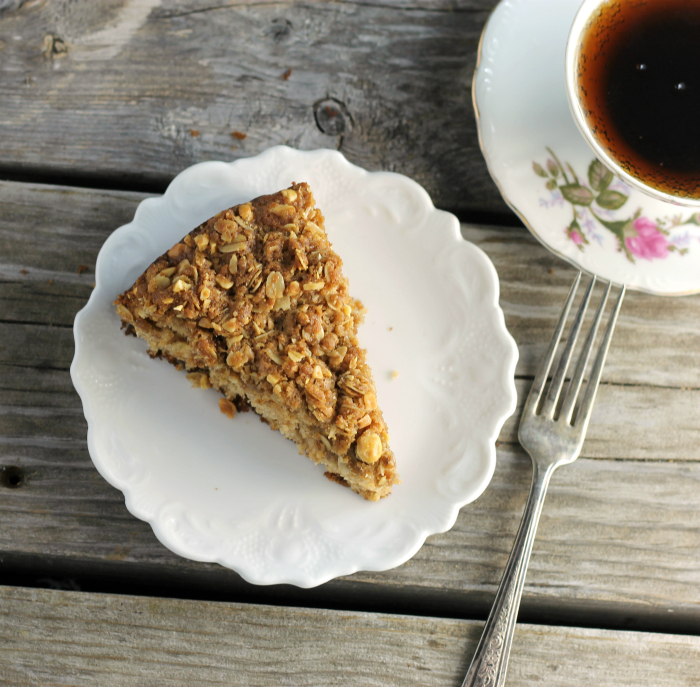 The Coffee Cake looks delicious with that yummy crunchy topping. Yeah, the crumble always gets me, too! What a lovely coffee cake! This sounds like a great coffee cake. I don’t think I’ve ever added oatmeal in one but it’s time to try it. Thanks for sharing! I love this cake ! I love the crumble. Look amazing ! This recipe looks absolutely delish! I was wondering how it would taste to substitute sour cream for peanut butter? Would it be too crazy? Thanks! Peanut butter might work, but I have never tried it. I love peanut butter, so it sounds good to me. If you do try peanut butter in the recipe please let me know how it turns out.